More than 12,000 service personnel from army, navy, air force, armed police, rocket force and strategic support troops took part in the parade at Zhurihe military training base. Dozens of soldiers stormed out of 18 helicopters landing on a sandy patch in the heart of the vast Inner Mongolian prairie. They joined thousands of other camouflaged soldiers in a massive military parade as tanks and missile launchers rumbled past. Fighter jets streaked across the clear blue sky, shooting flares. President Xi Jinping reviewed the armed forces on Sunday morning as part of the commemorations to mark the 90th founding anniversary of the People's Liberation Army (PLA), which falls on August 1. More than 12,000 service personnel from the army, navy, air force, armed police as well as the newly formed rocket force and strategic support troops, took part in the parade at Zhurihe military training base. China needs to build strong armed forces more than any other time in history as the Chinese nation is closer to the goal of great rejuvenation than ever, Xi said, delivering a speech after overseeing the parade. "The PLA has the confidence and capability to defeat all invading enemies and safeguard China's national sovereignty, security and development interests," said Xi, also general secretary of the Communist Party of China (CPC) Central Committee and chairman of the Central Military Commission. Xi, who was endorsed as the core of the CPC Central Committee in 2016, called on the PLA to stay loyal to the Party, boost combat capability and continue to serve the people. Observers said the parade had more of a combat feel as soldiers appeared as if they were gripped by the heat of battle. "Here, the soldiers have the stares that kill," said Wang Ruicheng, deputy head of the general office of the parade headquarters. Late leaders Mao Zedong and Deng Xiaoping also inspected troops in the field at key moments in history. 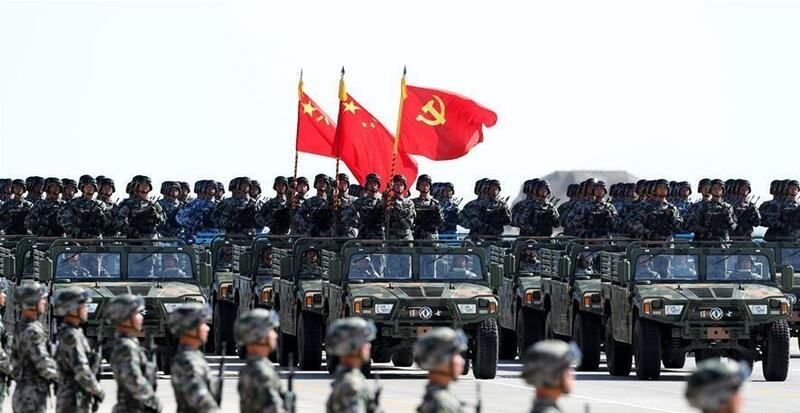 It is the first time for Xi to oversee such a large parade at a military base, and the first time for China to commemorate Army Day with a military parade since the founding of the People's Republic of China in 1949. A flag-raising ceremony is held during a military parade celebrating the 90th anniversary of the founding of the Chinese People's Liberation Army (PLA) at Zhurihe training base in north China's Inner Mongolia Autonomous Region, July 30, 2017. Sunday's commemoration began with a flag-raising ceremony at around 9 a.m.
Xi was greeted by Han Weiguo, commander-in-chief of the parade and commander of the Central Theater Command. "Comrade chairman, the troops are ready. Please review," Han said. Camouflage-clad Xi mounted an open-top jeep that drove along an airstrip. "Salute to you, comrades," Xi called out to the soldiers. "Hail to you, chairman," they replied. Xi alternated the greeting with "Comrades, thanks for your hard work," to which soldiers replied "Serve the people." "Follow the Party. Fight to win. Forge exemplary conduct," servicemen and women exclaimed to Xi in unison. 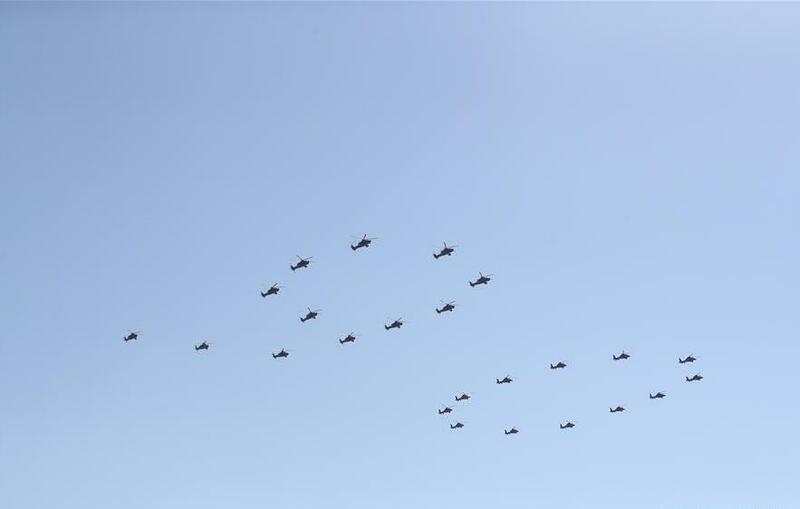 Forty-one attack helicopters flew in formations spelling Chinese characters "Ba Yi" -- or Aug. 1 -- and the number 90. The parade did not feature goose-stepping in a march-past. Instead, the officers and soldiers rode in military vehicles that rumbled past the rostrum. The gleaming armament showed how far the PLA has come since it was a small force with poor weaponry at the Nanchang Uprising in 1927. Today, the PLA commands about 2 million service personnel, one of the world's largest military forces. Xi said history had proved that the PLA was a heroic force that had followed the Party's command, served the country with loyalty, and fought for the great rejuvenation of the Chinese nation. On Sunday, cutting-edge weapons like J-20 stealth aircraft, 8X8 all-terrain vehicles, radar-and-communication jamming drones and solid-fuel intercontinental missiles were among about 600 pieces of military hardware on show. About half had never been paraded. New faces included female marines and an electronic warfare force under the new strategic support force. The public watched the procession from state media's live broadcast. The parade trended on social media. "I am so moved. Go PLA. Go China," said a netizen. "It is you who guarantee our happy life. Salute to you, PLA soldiers." A flag guard formation consisting of officers and soldiers from the army, air force, navy and rocket force of the Chinese People's Liberation Army (PLA) attends a military parade to mark the 90th anniversary of the founding of the PLA at Zhurihe training base in north China's Inner Mongolia Autonomous Region, July 30, 2017. 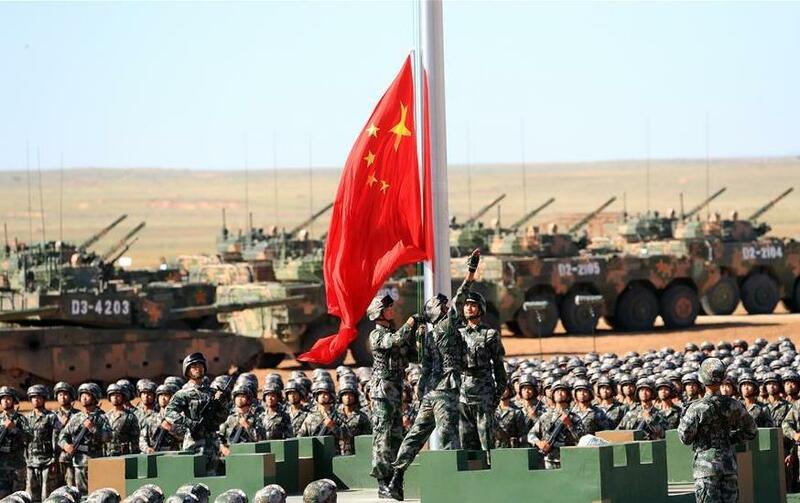 The parade at Zhurihe, which means "heart" in Mongolian, captured the essence of fundamental changes taking place in China's armed forces with sweeping reform measures unleashed in recent years. In just two years, the top bureaucracy was streamlined, military services balanced, the joint command system reshaped, equipment upgraded and border patrols increased. Meanwhile, China's second aircraft carrier was launched; more warships were commissioned; and new fighter jets, drones, and missiles were unveiled. "The size of the ground force has been greatly reduced to account for less than half of the armed forces," said General Li Zuocheng, commander of the PLA Army. "The army is getting fit as it turns modern and strong." The Zhurihe base has also felt the pulse of Xi's reform as the largest military training ground in Asia got busy. A lot more live-fire drills were conducted in the past few years. The country's first professional opposing forces brigade was created here, opening a new age in PLA training. Xi on Sunday again urged the PLA to focus on war preparedness to forge an elite and powerful force that is always "ready for the fight, capable of combat and sure to win." Twenty-four helicopters fly in the formation of the number "90" symbolizing the epic journey of the People's Liberation Army (PLA) in 90 years during a military parade at Zhurihe training base in north China's Inner Mongolia Autonomous Region, July 30, 2017. The troops frequenting the Inner Mongolian prairie today are different from the cavalry armies standing on the same turf commanded by Genghis Khan over 800 years ago. China's modern armed forces remain committed to peace. Chinese servicemen are actively involved in international peace-keeping missions. The country has sent about 35,000 military personnel, the most among permanent members of the UN Security Council, to at least 24 UN peace-keeping missions. Xi said that enjoying peace is a bliss for the people, while protecting peace is the responsibility of the people's army. "The world is not all at peace, and peace must be safeguarded," Xi said.